The number of CBD – aka cannabidiol – consumers has doubled in the last twelve months. Perhaps that’s why we’re seeing it everywhere from beauty products to coffee. Let’s take a look at what CBD is, whether it’s legal to use cannabis in food products and how producers can effectively harness it. Update: An EC ruling has made it likely the CBD will be subject to Novel Foods legislation. Find out more here. What is CBD and what can it do? CBD is short for cannabidiol which is the non-psychoactive component found in the cannabis sativa (hemp) plant. It’s often referred to as ‘medical marijuana’ and it doesn’t disrupt the central nervous system, unlike Tetrahydrocannabinol (THC) the other key compound in the plant which causes users to get high. CBD is not to be confused with hemp; CBD comes from the hemp plant and contains low levels of both CBD and THC. Hemp is used primarily as a food supplement due to its high levels of vitamins E and B and antioxidants. Multiple medical and health benefits? Much of the research is still in its infancy but key studies have led to effective medical treatments. For example, in the US in June, the Food and Drug Administration approved a cannabidiol-based drug called Epidiolex as a treatment for severe forms of epilepsy. CBD is said to have anti-inflammatory properties, to be able to counteract nausea, relieve pain and makes the consumer feel a sense of calm, thus reducing anxiety. Yes, cannabis is still classified as a Class B drug under the Misuse of Drugs Act 1971. However, CBD is permitted by the MHRA in the UK as a medicine and has been sold in the UK for many years. Products containing CBD are not illegal as long as they contain only trace amounts of THC (less than 0.2%). 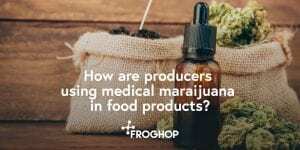 Can CBD be used in food products? In the USA, restaurants and producers are serving up CBD in varying forms from CBD-infused ricotta-and-honey toast, meatballs and gum drops. Here in the UK, Bogarts Coffee House in Swansea is serving shots of CBD oil in their beverages. However, there is a difference between CBD being legal and the CBD being approved for food use. So, the answer is certainly “yes” – but within strict limits. This means that food producers can use hemp that naturally contains a level of CBD in their products that is not higher than naturally found without concern for novel foods regulations. If it is extracted, concentrated or standardised then it may still be subject to novel foods approval. The limit on THC still applies as this is not legal above 0.2% of the plant. We’ve developed many successful, innovative new products, using novel and singular ingredients. Find out more about our services here.